You really never know what you will come across in your day. This past weekend I drove to High Falls, the source of Bancroft’s York River and the terminus of Baptiste Lake. The dam there was built to prevent flooding of the town of Bancroft in the spring and features a beautiful, complex waterfall below the dam. There is a bit of a pool of water immediately above those falls. That particular day i was surprised to find a family of ducks standing on the rocks and swimming in the fast moving water. 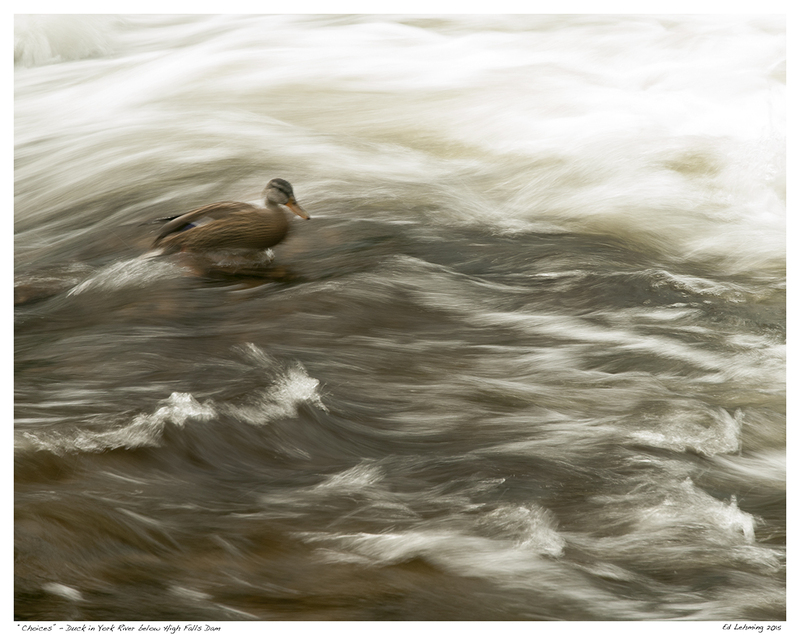 Every now and then one of the ducks would venture into the faster moving currents. Some would be nearly swept over the edge, only to fly away at the last moment. It was interesting to watch and I was surprised that none ever got overtaken by the current. There must have been food in the water because the duck could have moved a few yards up river into calm water. This particular fellow seemed to be contemplating his next move, standing right next to the fast flowing current. Eventually he made his choice and flew over the current to a calmer section. This entry was posted in Photography and tagged Bancroft, behaviour, choices, duck, lake, Nature, ontario, Rapids, river, Water, waterfall, York River on July 27, 2015 by Ed Lehming Photography. The city of Kingston, Ontario was a military outpost for many years. The War of 1812, between America and Britain (Upper Canada), caused to be built many fortifications. Among them Fort Henry and supporting structures such as several Martello Towers which still stand today, beautifully preserved. I had the opportunity this summer to tour one of these amazing structures, which at one time held about 20 soldiers to be on watch for, and repel, any attacks from America over Lake Ontario and the adjoining shoreline. The tower also contains a 35 pound cannon which rotates 360 degrees. 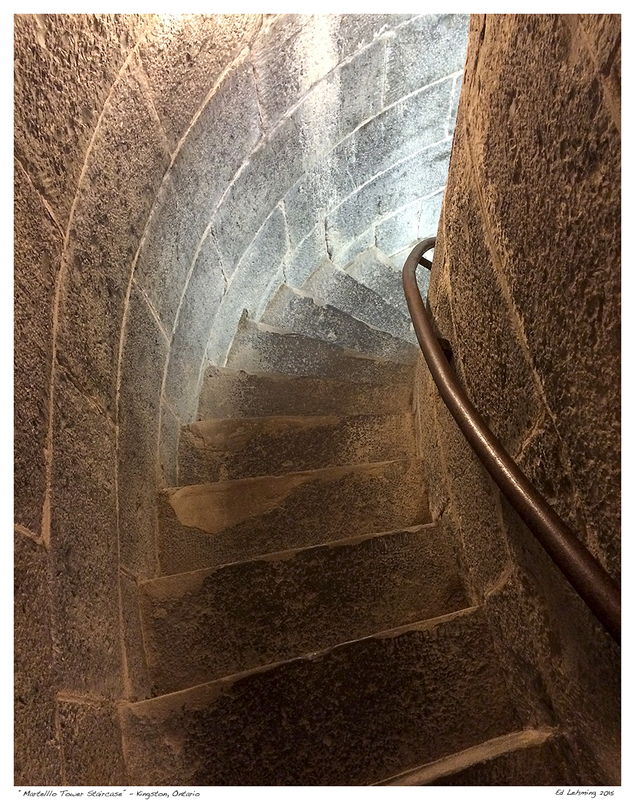 I was particularly taken with the amazing stonework and especially this winding staircase which come down from the upper cannon level to the main floor. I like the way the light shines up the stairs and reflects off the stonework. This entry was posted in Photography and tagged climb, curve, down, history, Kingston, railing, stairs, stone, tower on July 21, 2015 by Ed Lehming Photography.